The dust has settled… the boxes have been unpacked and we’re settling into a new routine. As life becomes less chaotic, I am feeling a bit more lonely. Friends and family seem so far away. It doesn’t help that Rob is sometimes working out-of-town. At least I interact with my co-workers. I don’t know how Rob copes with mostly working from home. Not too much real people interaction except from the coffee shop down the road. Limited integration with other Texans. So, be it resolved… our next goal has to become more social. Baby steps. This weekend, we have cycling plans and curry+games plans [BANANAGRAMS!]. It feels good to get back into my social groove. 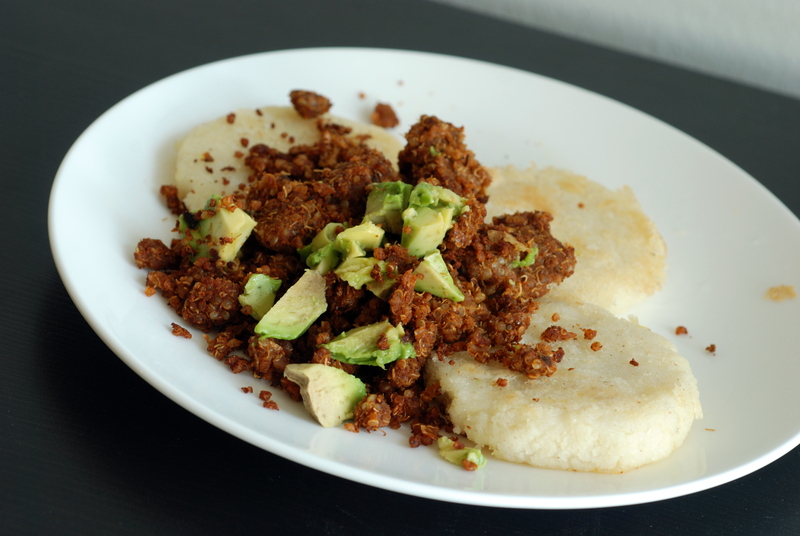 And these chili lime crackers? They bring me back to good times in Toronto. 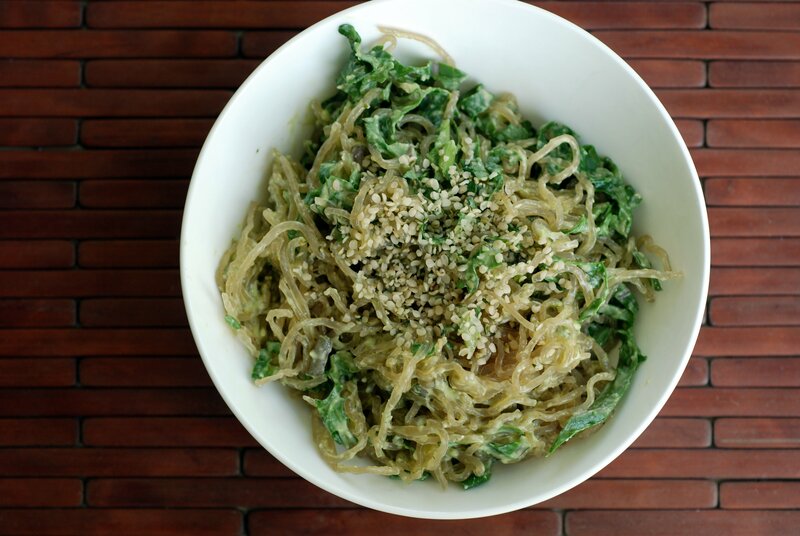 Just before we left, I visited Superfoods Eateries, a quaint resto with take-away raw foods. Between Rob and I (and a few free samples), we tried a variety of dishes. Luc, one of the owners, was incredibly enthusiastic about explaining the menu. My two favourite dishes were the cheesecake and corn nachos. They also had a lovely sandwich at one point but I don’t see it listed on their website menu. Their selection varies from day-to-day, especially after each item sells out. (I really, really wanted to try their chocolate cake but it was not available until after I left). The coconut-based cheesecake was not as heavy as other raw cheesecakes and unique because it had a slightly fermented/cheezy zing to it! It was definitely special. But those corn nachos, oh my. Delicious. 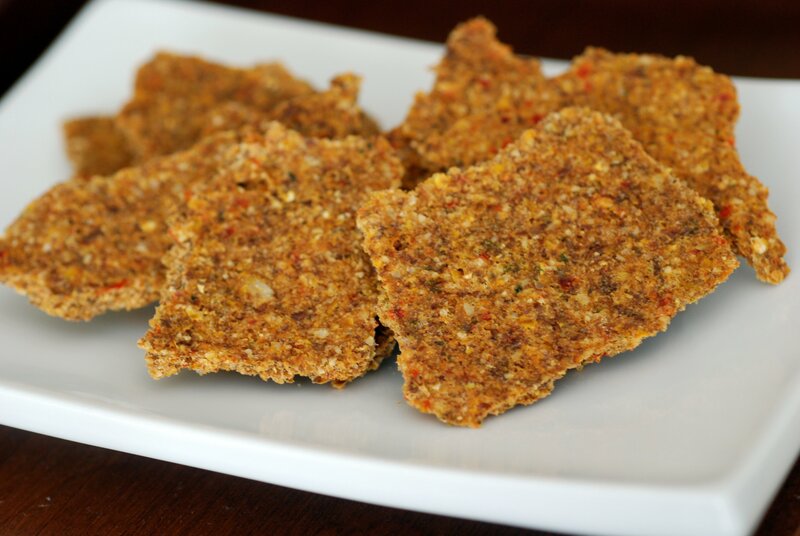 They are corn and flax based but thin and crispy with an exotic twist from the orange juice and cilantro. 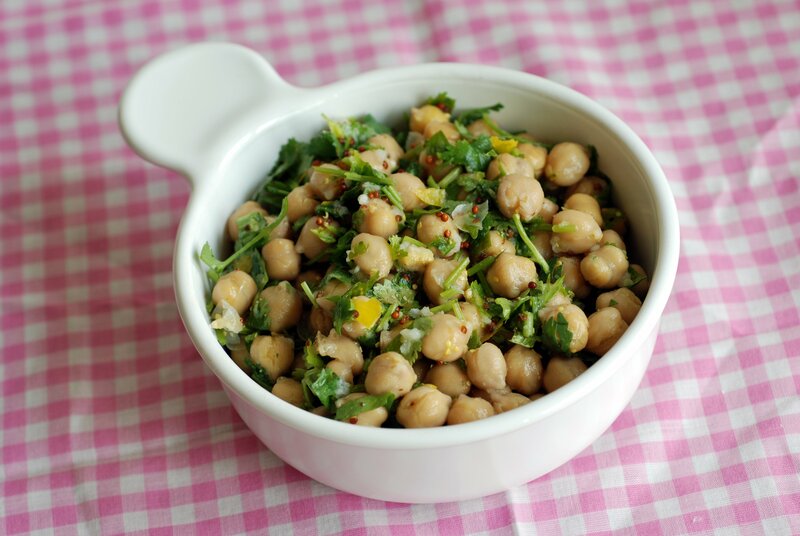 Rightfully addictive and perfect with a dollop of guacamole. Now that I am miles away, I figured I would try my own hand at the nachos. I will admit that mine are not as good as the original, but they are still good in their own regard. I tried to add as much veg-powered nacho-like flavours to the chips. The chili and lime flavours were the highlight. The nuts and seeds make for a filling cracker, although a bit thick. As such these are more akin to crackers and weren’t as crispy as chips.. but still complex and delicious. When I chat with friends from home, I field many similar questions. Have you finished unpacking? YES!!!! How am I finding the heat and humidity? Not that bad… Is Houston friendly for cyclists? My route to work is actually pretty devoid of cars, so I can’t complain. How is the food… and the veggie selection? One of my friend was interested in how I triaged the stocking of my fridge and pantry. What did I buy first? What were my perishable and non-perishable necessities? Since we were without a kitchen for almost a week when we arrived, I continued with my travel-friendly eats: overnight oats with chia seeds and protein powder for breakfast, hummus with carrots and crackers for lunch and snack, and easy eats for dinner once I made my first grocery run. We hit up the closest grocers (Trader Joe’s, Whole Foods and Fiesta Mart) to scope out our new neighbourhood and begin our pantry. See below for what I commonly keep in my kitchen. I have had a much larger pantry in the past but I am trying to keep things limited to what I will consume in a year. What are things that I have missed that you cannot live without? With a name like “Brown Sugar Cardamom Snickerdoodles”, you might think I was creative in the kitchen. The joke’s on you because, I just worked with what I left in my pantry while I was still in Toronto. Without any chocolate in the house, I had to turn to non-chocolate dessert options for our going-away party. I knew I was going to make baklava, since I had planned to make it a few months ago and had all the ingredients (mostly). Plus it would be a treat for my parents who came up to help us pack and move. But I wanted to make something else, too. I perused Isa’s blog for inspiration: Chai Spiced Snickerdoodles. However, I had no white sugar and not all of the chai spices…. but I still had brown sugar. I was not entirely sure whether it would work, so I googled brown sugar snickerdoodles. 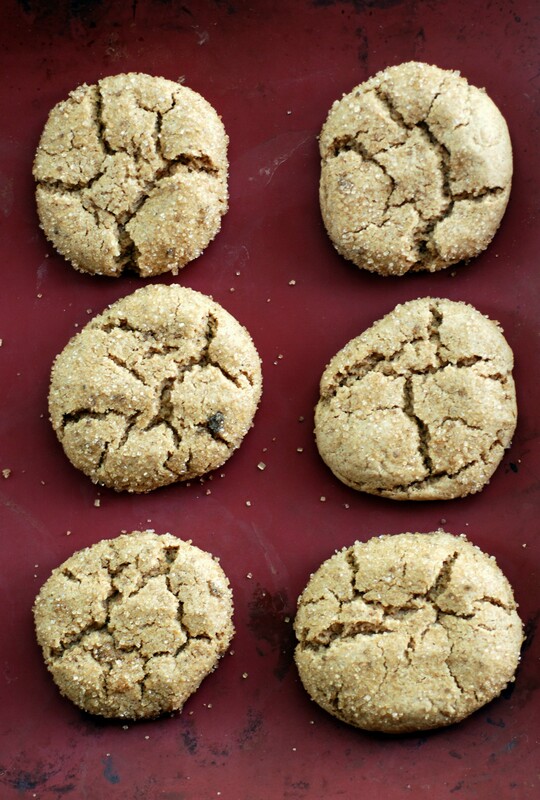 I came across Joe Yonan’s Cardamom-Brown Sugar Snickerdoodles. Brown sugar would work, it seemed. And my lack of spices would not be a deterrent, either: I had cardamom. However, Joe’s recipe was not vegan so I tweaked Isa’s recipe with my pantry subs. And of course, while baking seems so simple, I definitely prefer the ease of raw desserts. As I made this, I was scratching my head wondering what to do with the clumpy brown sugar that was not dissolving. Heating it was a possibility but I wasn’t sure that would still work since I had already added it to the liquids. I consulted the Mom guru midway during my baking escapades. If the sugar had not been added yet, she suggested microwaving the brown sugar. Since I had already added the liquids, she had another fantastic idea: pulverize it with a blender. Since I already dirtied my vitamix to make homemade cashew milk for the cookies, it was easy to blend away the clumps, too. Worked like a charm. Some of the comments from Isa’s recipe implied the dough could be very sticky to work with. Mine was not sticky in the slightest. Easy to work with, flatten as balls and roll in a cardamom-spiked brown sugar coating. 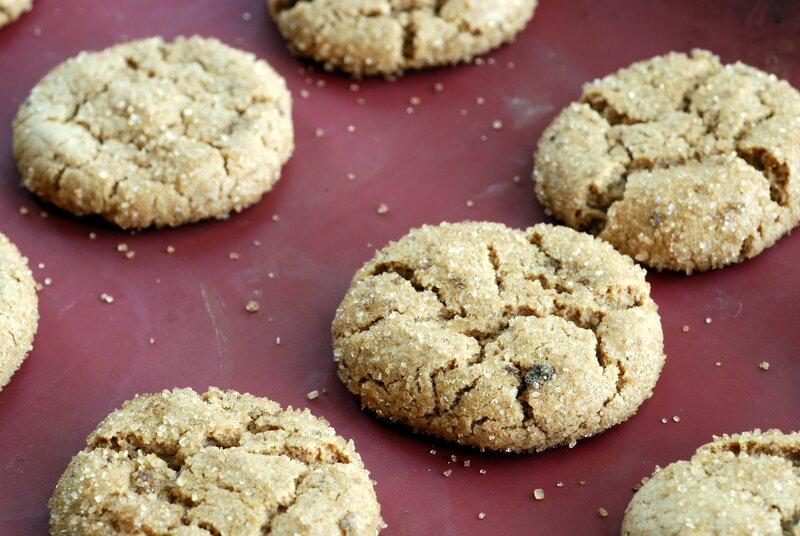 I used large crystal Demerara-style brown sugar for the coating and saved the clumpy brown sugar for the cookie. And the verdict? You will have to rely on Rob’s judgment. My Mom does not hold too much faith in Rob’s opinions of my food (is he really biased?) but trust me, there are plenty of things he does not like and he will tell me so. Around the same time, Rob was gifted with local maracons. However, they were very fragile and slightly smooshed during transport. After he tried a snickerdoodle fresh from the oven, he told me it was better than the macarons! They were smooshed macarons, but still, they were macarons, nonetheless. These cookies were crispy on the outside, soft on the inside with a sweet caramel flavour thanks to the brown sugar with a hint of exotic cardamom. And if Rob’s opinion is not enough, let’s just say the cookies were demolished within minutes at the party. Granted, I served them before the pizza had arrived… and no one had issues with cookies as an appetizer. I knew you would miss me in Canada, but I swear, I did not wish Houston upon you. First there was the Toronto flood. And now there’s the heat wave. Your heat wave is my new normal. Although last week was actually quite mild. Lots of rain meant the temps were only peaking at 85-90F (29-32C) (before humidex, add another 10 degrees please). Whereas in Canada, you can boast about the amount of snow you endure, in Houston, it is the heat. Although, to be honest, it is not as bad as I feared. Why? Because biking is better. Working long hours. And a/c is everywhere. Yes, my long working hours mean that I cycle to work before the sun is shining too brightly and my commute home is after the mad rush from the Texas Medical Center. I swear, a leisurely bike ride is better than walking in hot weather since you make your own wind. I basically meander from one building with a/c to another with a/c (on really hot days my car’s a/c has trouble keeping up, though). And drink lots of (flavoured) water. I also have not been cooking too much. Eating, yes. Cooking, no. Salads, yes. Lots and lots of veggies. Even though my home has a/c, I do not feel like turning on the oven too often. Raw food for the win! Simple raw food for the win. 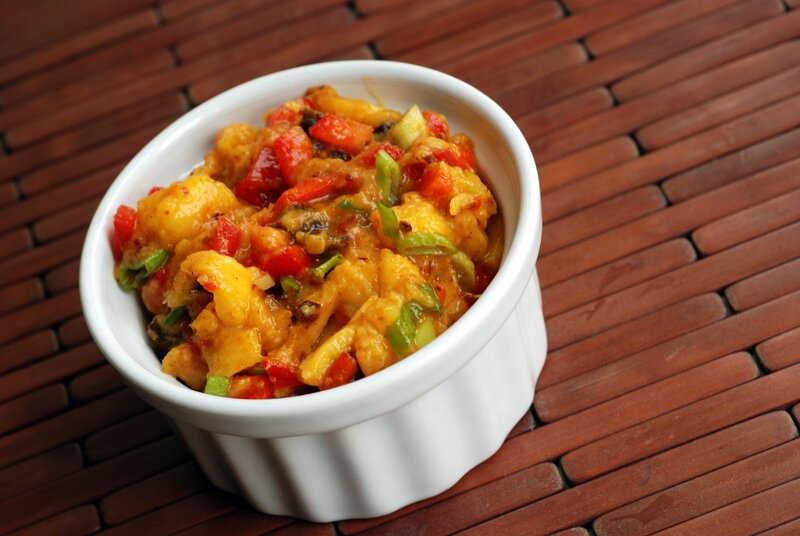 Chutneys can be really spicy or ookey sweet. Neither which really appeal to me. I’ve made a simpler fresh mango chutney, paired with mung beans, but this time I focused a bit more on the chutney as a vector for flavour. 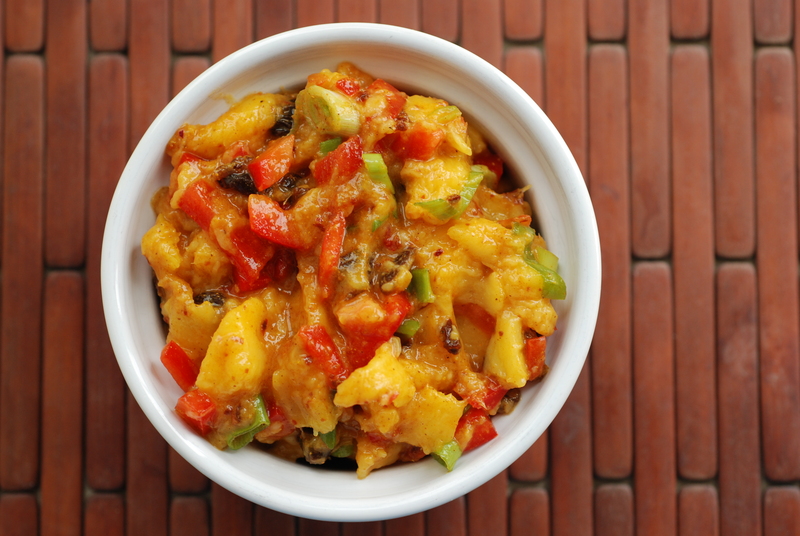 Mango, red pepper, ginger, onions, chile flakes, curry powder and even raisins. 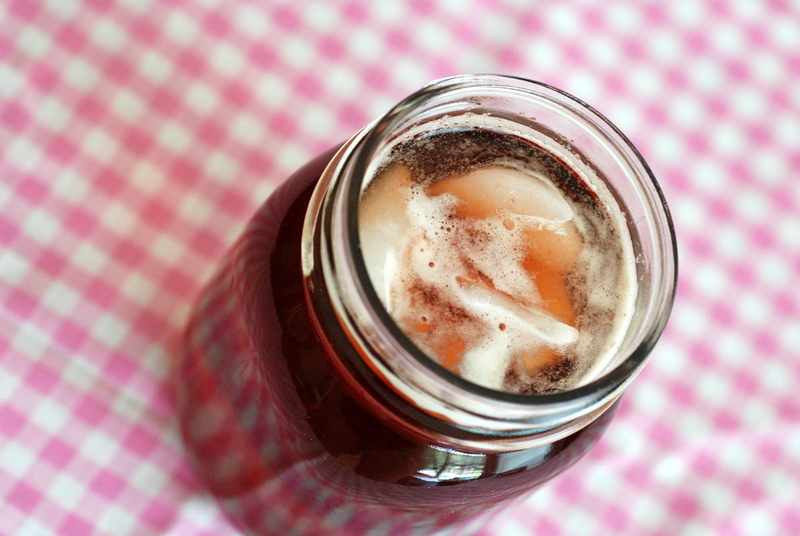 Apple cider vinegar gives you the tang you associate with traditional chutneys. 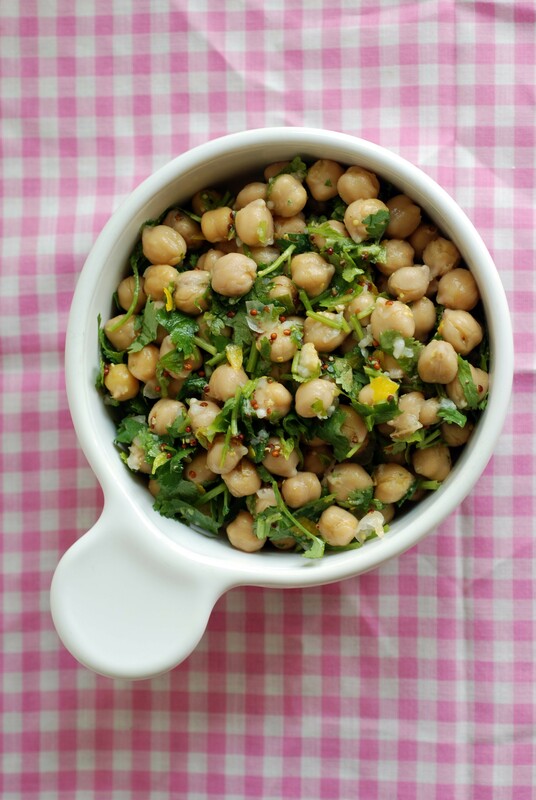 Use it as a dip, a salad topper or on top of your favourite curry. Whatever you pick, it is quite refreshing. I thought I had adequately prepared for a few days without a kitchen. I packed a paring knife, cutting board, can opener, garlic press and lemon press with me during our road trip. No pots meant I couldn’t cook up quinoa. No cups meant I couldn’t even boil water for tea. Never mind anything more fancy that needed a skillet. Basically, it meant I could make salads. This isn’t a boring salad, though. 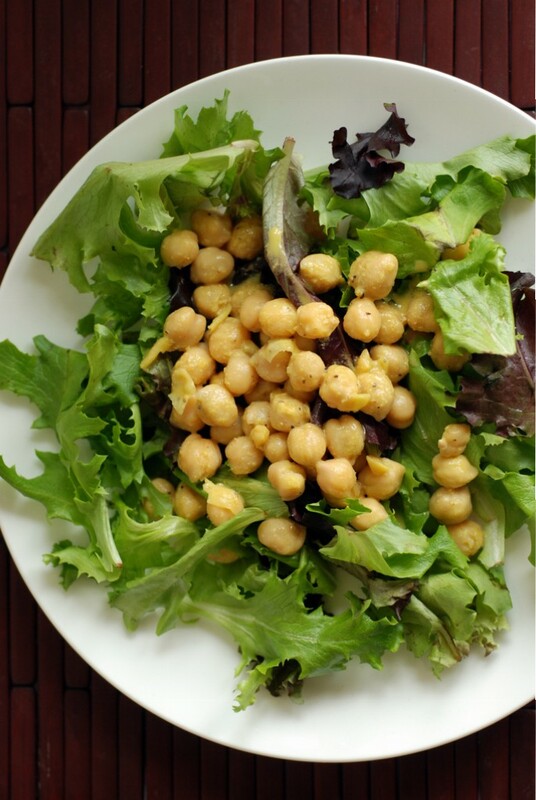 In between unpacking and snacking on hummus, I made this delicious chickpea salad when we first arrived in Texas. Of course, after I stocked up the fridge. Super simple: mix and marinate. It looks uninspiring but it was a nice balance between the tart lemon, fresh cilantro and sharp garlic. Lemon zest? Well, without my zester, I shaved off the lemon peel and chopped it with a knife instead. However, the zest in this salad is from the garlic, not the lemon zest. The garlic was stronger when I originally made it, but it tamed itself for leftovers, which made it perfect for lunch. It was also delicious overtop mixed greens for a more green salad. 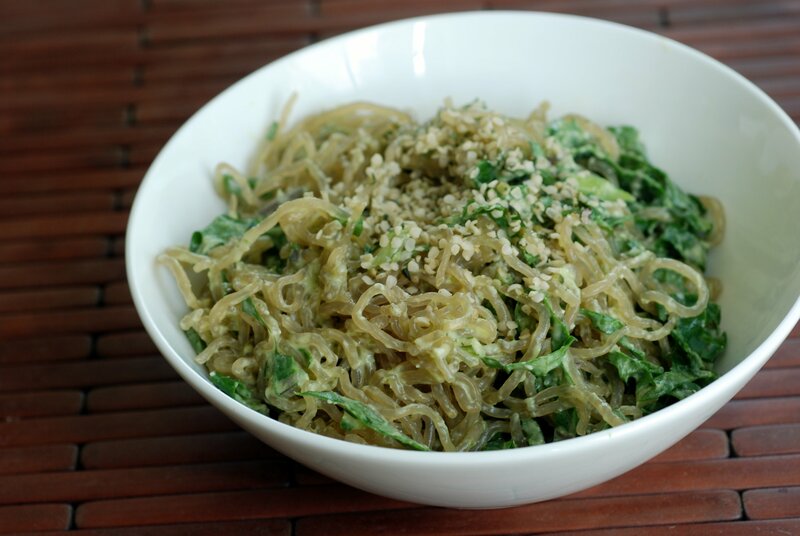 This is my submission to Deb for this week’s Souper Sundays and Virtual Vegan Linky Potluck. Preparing for our road trip meant making a bunch of travel-friendly snacks. Preferably something with a bit of sustenance, too, in case we ran behind schedule. One of my favourite snacks these days is dry roasted soybeans. Crunchy and satisfying. High protein, to boot. I don’t know how it is made, because frozen edamame doesn’t look anything like what I buy pre-roasted. 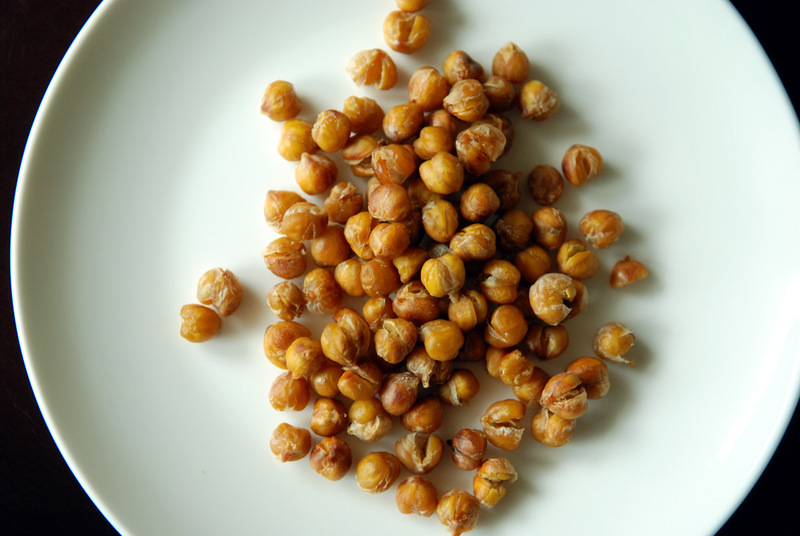 Instead of experimenting with homemade roasted edamame, I roasted chickpeas. 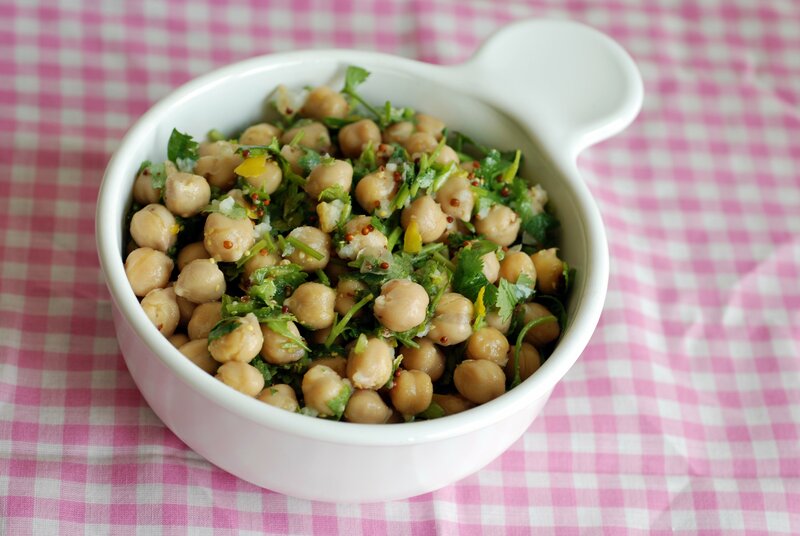 While I adore most things with chickpeas, roasted chickpeas have been hit or miss with me. It may have something to do with roasting the spices directly on the chickpeas, since I have also had troubles with baked spiced sweet potatoe fries. Leave the spices in the oven a bit too long and they may burn. Lately, I’ve taken to adding the spices just as they come out of the oven, like with these chickpeas and cauliflower spiced with dukkah. But how about something easier to tote.. less messy.. something in classic snack flavours…. 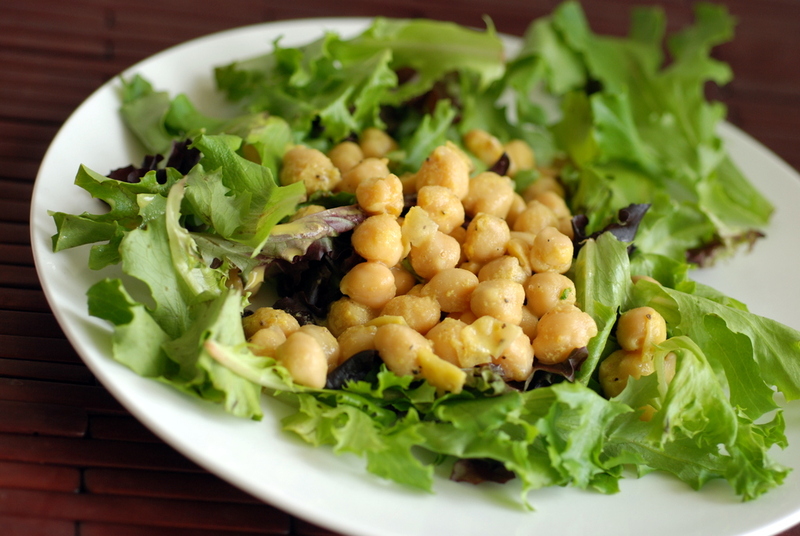 and here I bring to you roasted salt and vinegar chickpeas! 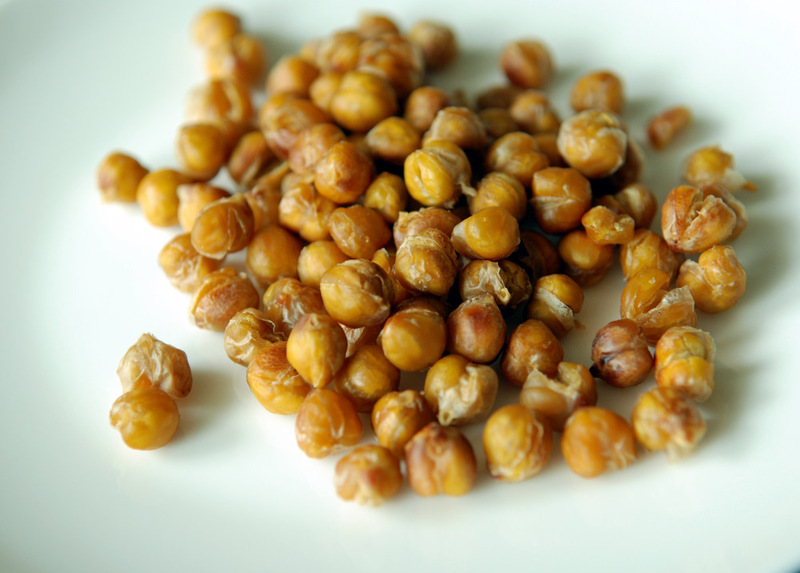 Infuse your chickpeas with vinegar by boiling them slightly, toss with a bit of salt, then roast them. 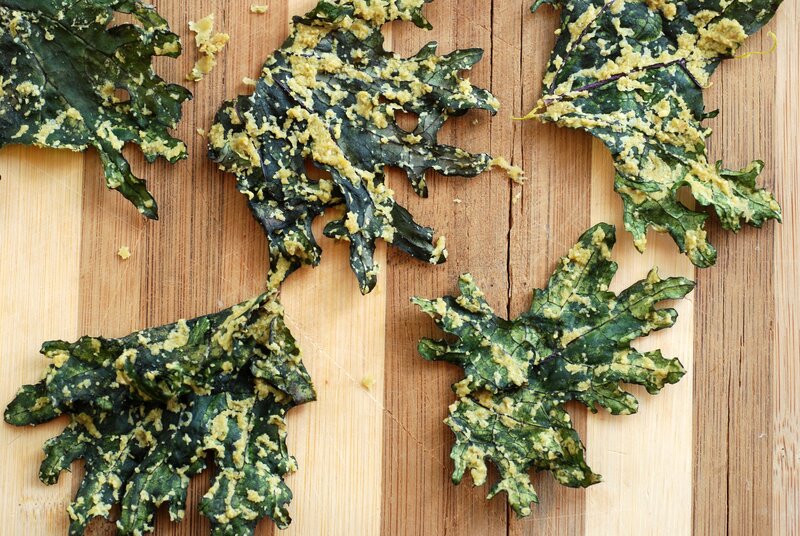 Easy, peasy, for a delicious high-protein snack. I preferred these shortly after roasting as they maintained their crispiness. They lost a bit of their glorious luster as leftover snacks but were still very good. 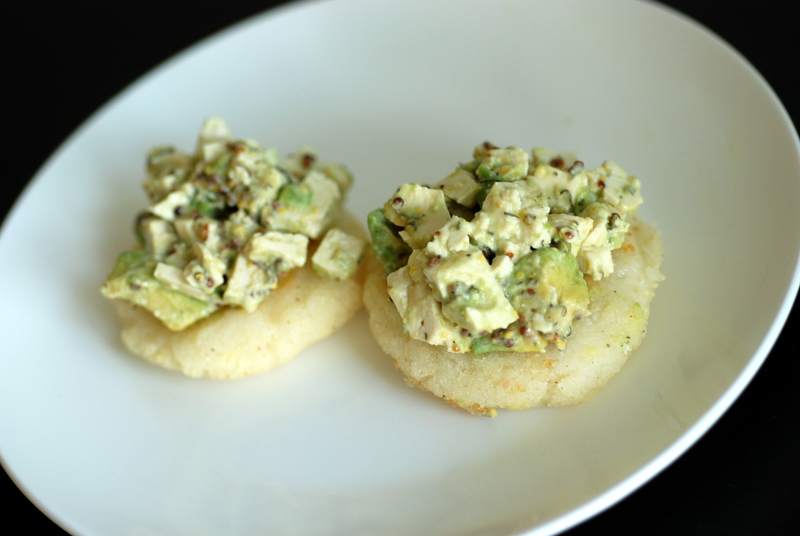 This is my submission to this month’s My Legume Love Affair, hosted by Aparna, and to this month’s Credit Crunch Munch. Of my blog readers, only a handful are from my family. Rob and my Mom are my biggest readers. So, when I say something here, I am held accountable. When we planned our move to Houston, I said we were going to try a minimalist lifestyle. I was going to leave my dehydrator behind. But then, I kept making more and more things in my dehydrator. I had forgotten how lovely it was to make things in the dehydrator. I also forgot that I wasn’t going to let life pass me by, either. We are planning to camp in the desert (via Burning Man), continue the long distance cycling (via the MS 150, Houston to Austin) and hopefully squeeze in weekend trips (sadly, my vacation days have dwindled down to nothing). It is times like these that portable snacks work their magic. So, as we packed, I kept reconsidering whether or not to bring my dehydrator. To be fair, it is a space hog, but it is light. It is mostly filled with air! Eventually, Rob had heard enough. After I made these kale chips, he definitely reconsidered his position. Thankfully, I did a mass kale harvest prior to our move. 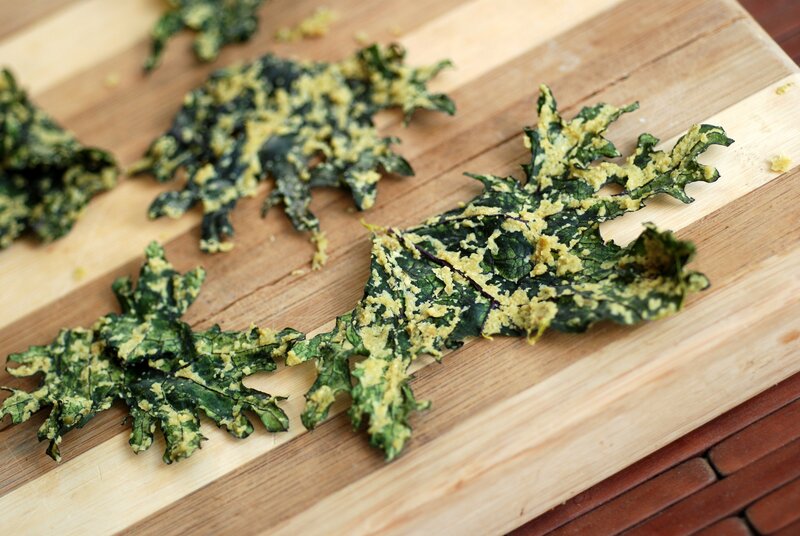 These were one of our favourite kale chip flavours. I thought they tasted like Sour Cream and Onion, with a touch of cheese, if you include the nutritional yeast. One of our friends agreed they were delicious but tasted more of the scallion undertone. 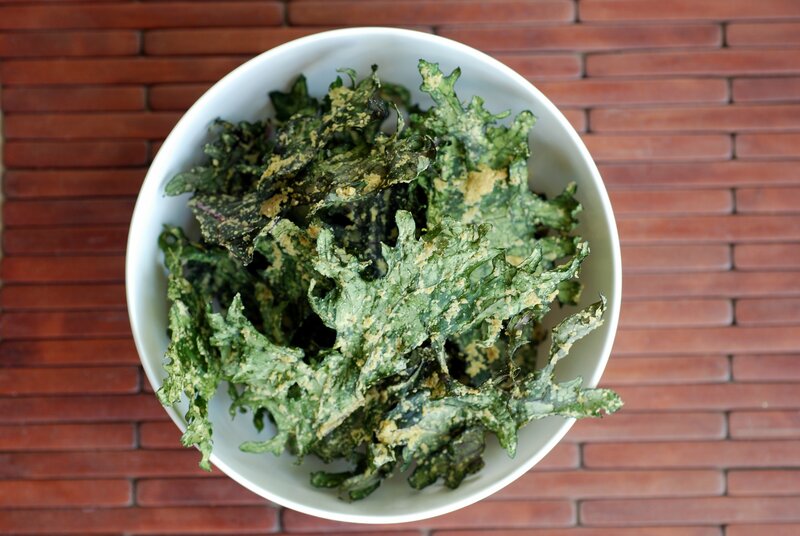 Either way, it made a believer out of me for the power of kale chips. Hourrah! 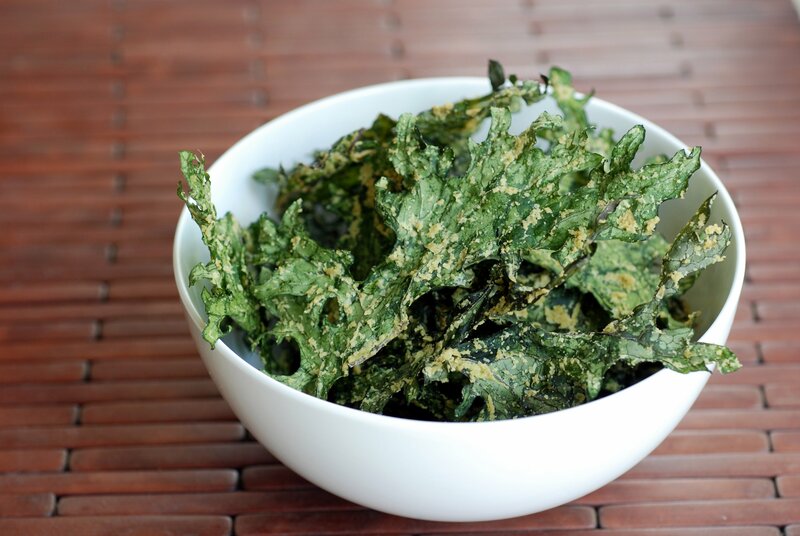 The question will be whether I can keep up with the kale chip demand, though. We can plow through them so quickly! Living in Toronto, my kitchen accumulated a lot of stuff. 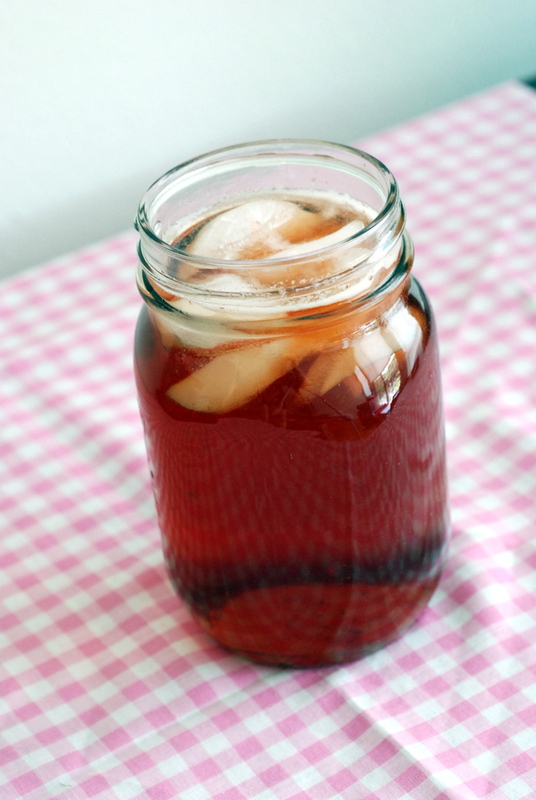 Gadgets, ingredients, Mason jars, you name it. All for the best, though, allowing me to explore new favourites. Thus, when we moved to Houston, we pared down our kitchen, minimalist-style. Minimalist, in comparison, because I am not willing to compromise in the kitchen, either. Do I need 5 different whole grains all the time? No. I will repopulate my kitchen with my favourites. 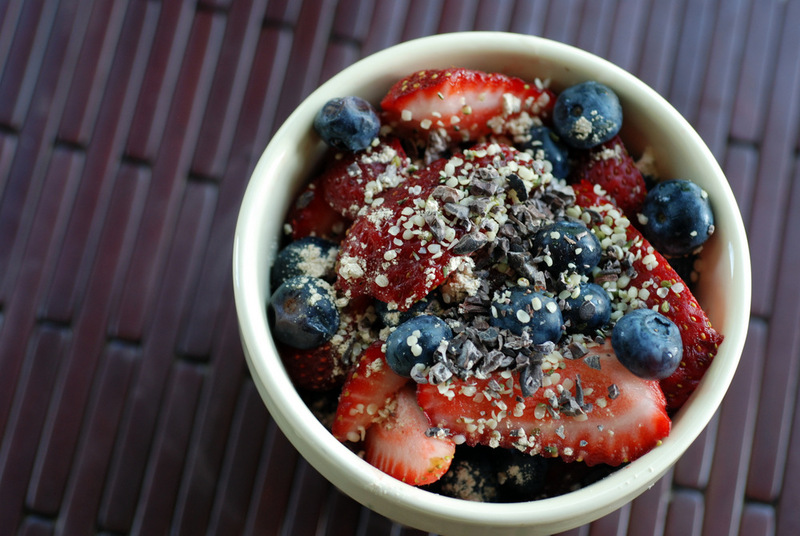 Quinoa, brown rice and oats. Beans? 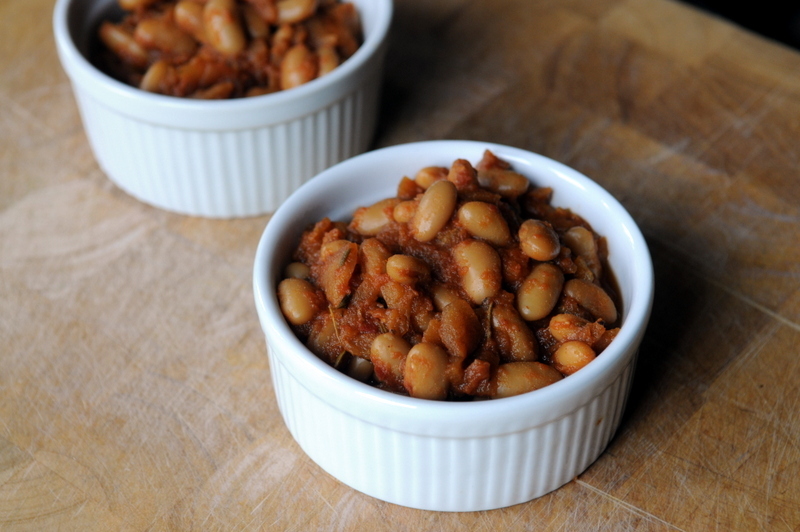 Right now, I have been mainly munching on canned beans (we don’t have containers/bags to freeze beans yet and time has been a bit sparse). 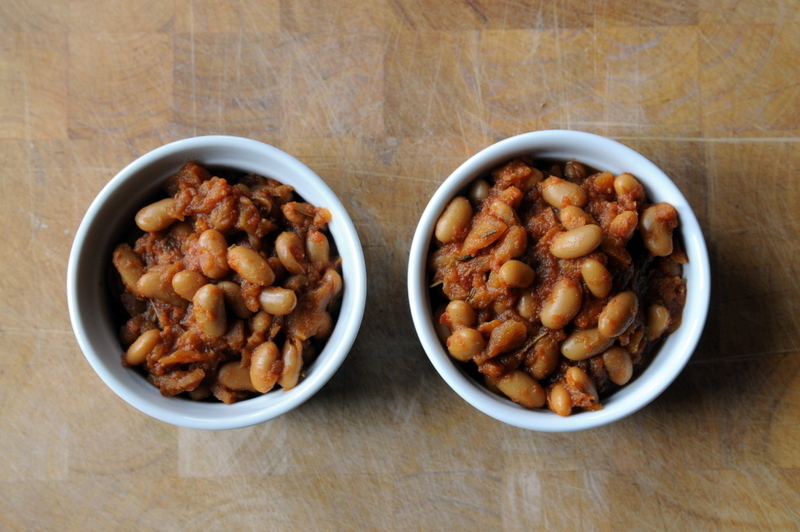 OK, I will still have many beans (don’t forget, I can order from Rancho Gordo directly!) but my collection will not as big as my last. I still don’t feel deprived in the slightest. There are constant permutations and combinations to try out. 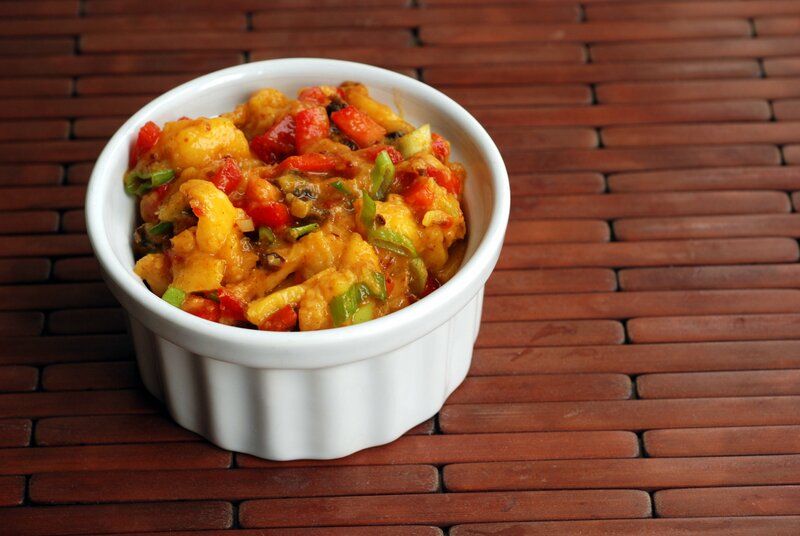 The recipe may look the same, but a change in spice can make all the difference. While still in Toronto, I was had a cook-date with a friend after work. 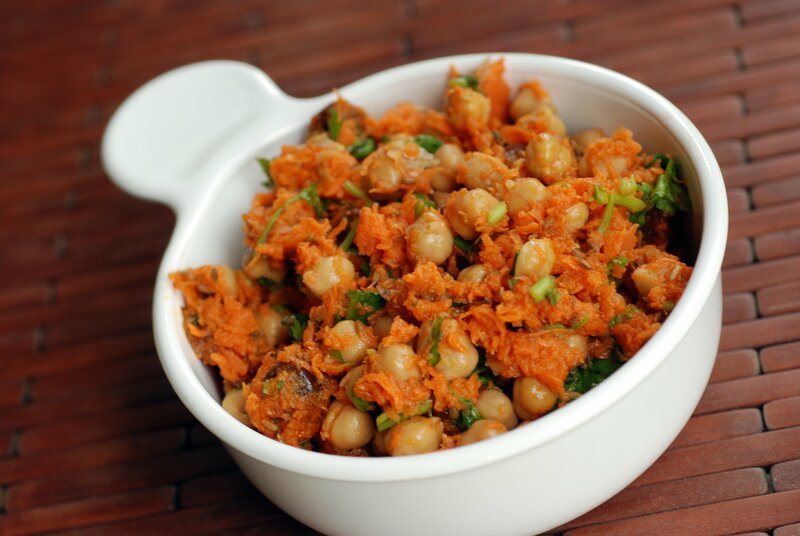 I suggested making Heidi’s Moroccan chickpea and carrot salad. No cooking required, it was filled with my typical pantry staples. However, not everyone always has a lemon on hand, grows mint in their backyard (I don’t have that anymore), stocks prunes (um, yeah, not me either) or has a spice grinder. So we made do with what she had. Lime instead of lemon, cilantro instead of mint, dates instead of prunes and we kept the cumin seeds intact. It may just be a label, but I wondered whether these changes would make this salad less Moroccan. Dates, cumin and carrots are very common in Moroccan cooking. However, I typically ascribe cilantro to Indian and southeast Asian cuisine. Turns out, cilantro is pervasive in Moroccan cuisine as well. Moroccan, with a twist, perhaps. With the mix of sweet dates, earthy cumin, tart lime, bright cilantro and crunchy carrots, it was very good. 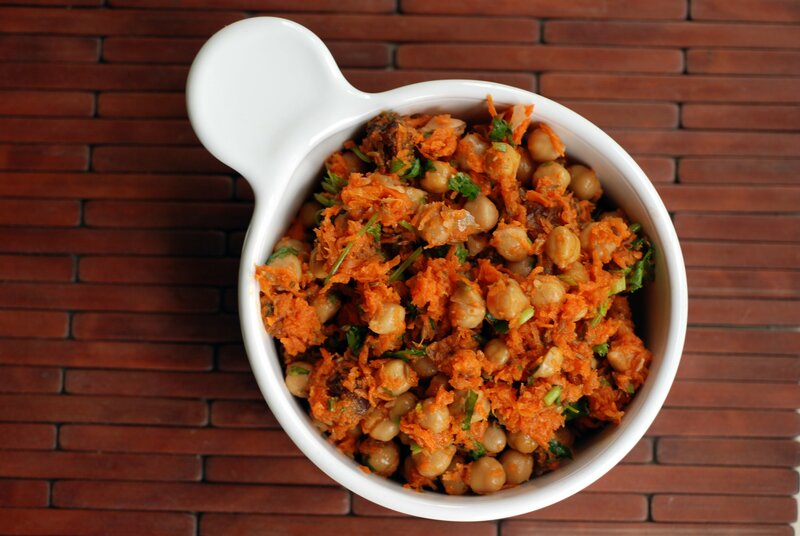 It should not come as a shock, since it is very similar to my beloved Curried Chickpea Salad with Carrots and Currants with a smattering from my Moroccan Carrot Salad. Next time, though, I think I will try the original recipe. A tasty variation on a similar theme. You will have to forgive me. There may be a forthcoming onslaught of recipes using the dehydrator. Towards the end of my move, the dehydrator was out in full force. Need travel snacks? Dehydrate them! Not sure what to do with random bits and bobs in the kitchen? Throw them together to get dehydrated. I quickly reconsidered my suggestion to move without the dehydrator. It suddenly made sense to bring it along for the ride. 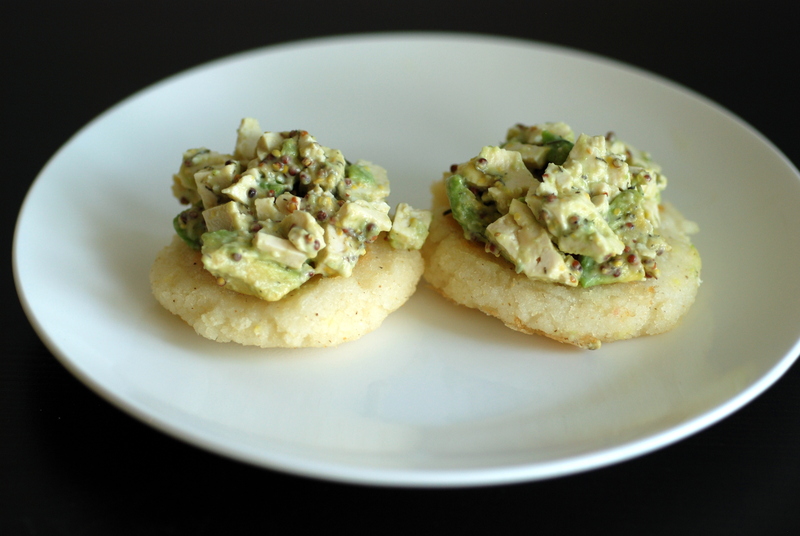 I bookmarked this recipe because it promised to be better than Ritz crackers. 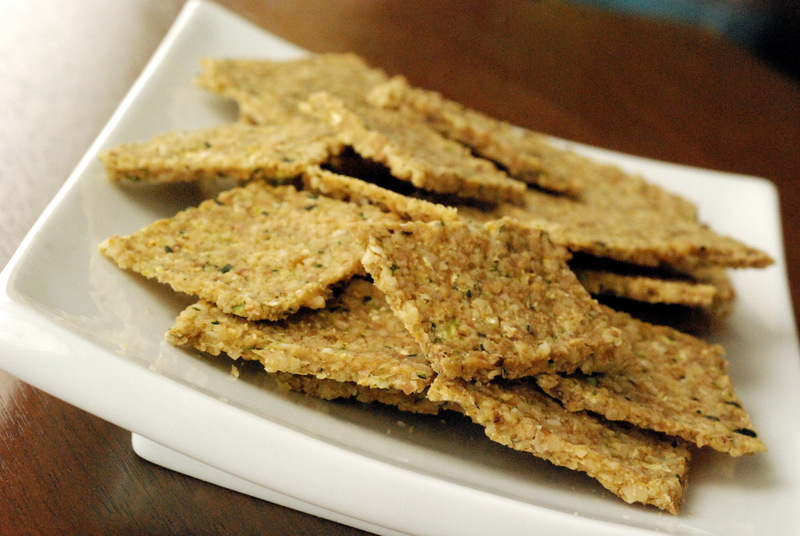 It was also a fun way to sneak zucchini into a cracker along with walnuts, flax and hemp seeds. 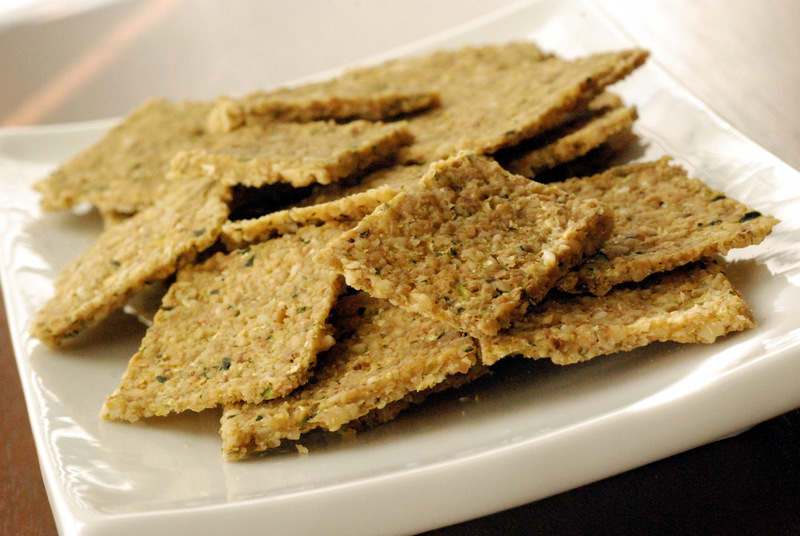 Unlike my previous savoury hemp crackers, I kept the flavours neutral. This way, they can equally be paired with homemade nutella, vanilla blueberry chia jam, vegan smoked salmon, rosemary cashew cheese, or a nacho cheese sauce. Or go even more travel friendly with a simple tomato and avocado. These crackers were a bit salty for my tastes but they were somewhat reminiscent of Ritz crackers, in the way walnuts can be buttery. However, they were more coarse due to all the fun bits in it. 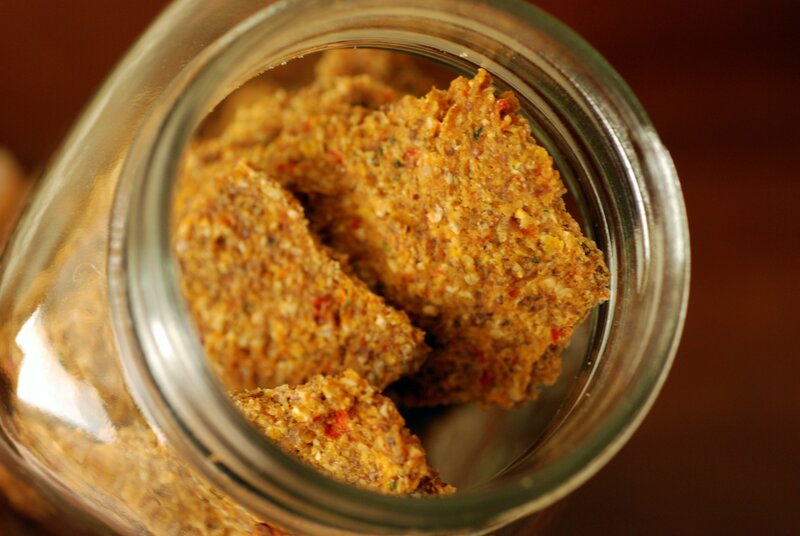 For those that do not have a dehydrator, these crackers can also be made baked. And I don’t mean with the oven going for 8 hours. See below for a baked option.